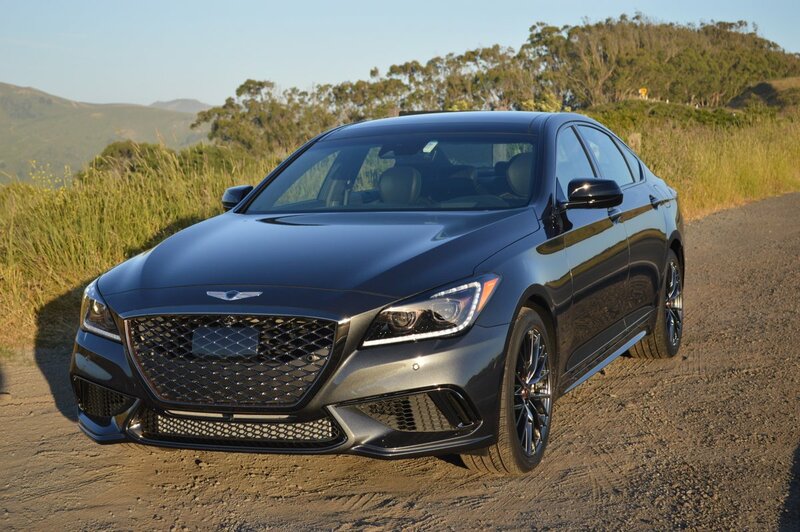 We’re barely half way through 2017 but since model year clocks run double time in Korea, we have already driven the 2018 Genesis G80 3.3T Sport sedan. It’s a winner. 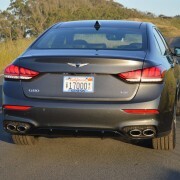 This delicious looking concoction handles so well and accelerates so hard that it will plant seeds of doubt in anyone aspiring to buy a much more expensive BMW, Mercedes or Audi. 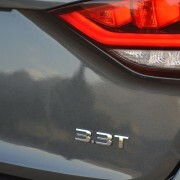 Mid-size sedans from the German big three cost can easily double the price of the G80, which retails for just $56,225. 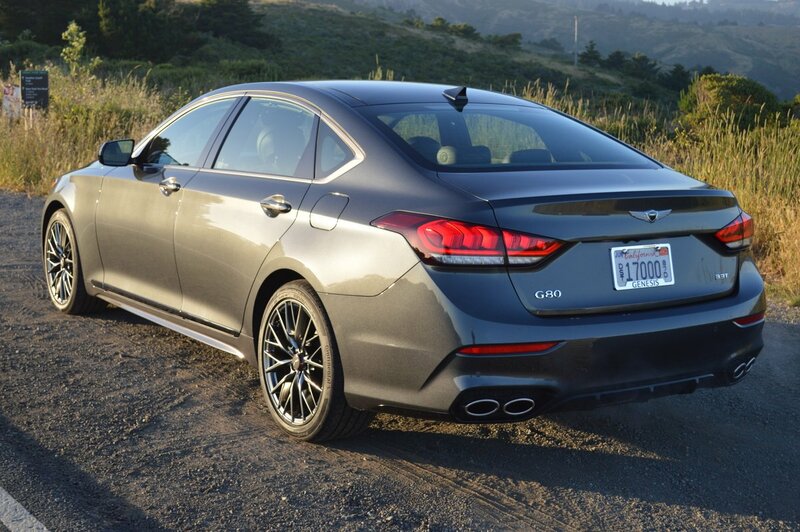 Hyundai hatched the Genesis line from their previous G80/90 luxury sedans. 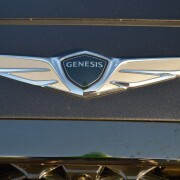 Think of Genesis as a newly positioned up-market brand, as Lexus is to Toyota, or Infiniti is to Nissan. 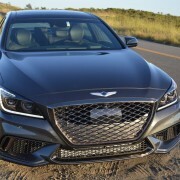 With the advent of this 2018 model, the G80 moves into its second year of production with some notable changes to pique the interest of sporting drivers. The twin turbo 3.3T Sport is available for the first time as a separate model in 2018. 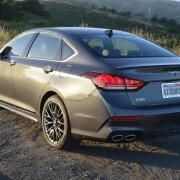 High on the list of important features is its “Sport CDC Suspension with Intelligent Drive Mode.” Genesis engineers have endowed the G80 platform with a fully independent suspension system that covers all the bases of daily driving, from plush freeway ride to taut mountain pass precision. In the “Eco” mode, the suspension swallows up road irregularities with relaxed imprecision. You’ll feel some float over bumps as the shocks damp inputs at the expense of precise snubbing. 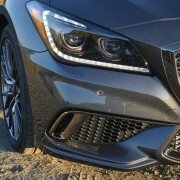 But if you slide the G80′s ride control switch into the “Sport” mode, the shock valving firms up instantly, the steering reacts with greater precision, and the throttle pedal requires less travel to spur the 365hp double turbo V6 into immediate action. 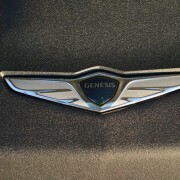 Tire choice also receives careful attention from Genesis. 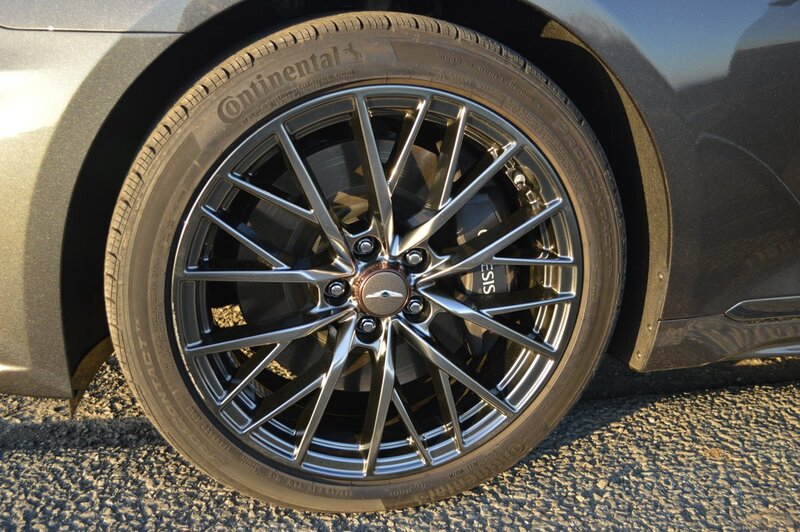 Top line Continental Conti Contact GT rubber blesses each corner. 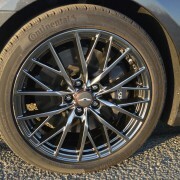 These tires, mounted on dark chrome 19 inch alloy rims, measure a hefty 245/40R19 up front and an even heftier 275/40R19 in back. The Continentals boast aggressively siped sidewalls for good rain dispersion, but they perform quite effectively in dry weather as well. The only negative is that they generate some queasy tramlining on grooved concrete pavement like you find on bridge roadways. 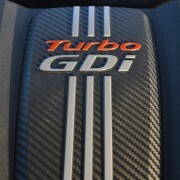 The G80 turbo V6 is extremely quick in a straight line. Quick enough to accomplish virtually any passing maneuver you care to attempt. 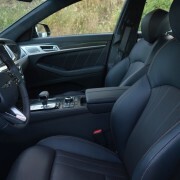 However, bear in mind if you have locked the 8-speed automatic transmission in “Drive,” the turbo needs at least a full second to spool up to max power If you need more instant punch, press the gear “lockout” button next to the Shiftronic shift lever, then make your shifts via the paddles on the steering column. 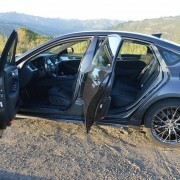 This routine locks the gearbox into the gear you have selected and thus eliminates the turbo lag factor. 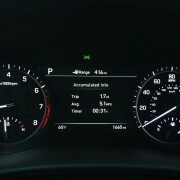 It also involves you more fully in the sporting operation of your G80 Sport. 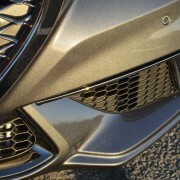 However, should you decide to lay back and trundle along at a less than interstellar pace, just dial up “Eco” on the Drive Mode selector, settle back into one of the most supportive sports seats you’ve ever occupied, and let the 17 speaker Lexicon audio system lull you into bliss with its “Quantum Logic Surround and Clari-FI.” Of course, it goes without saying that Android Auto and Apple CarPlay are part of the infotainment system, along with a 90 day subscription to SiriusXM Radio. 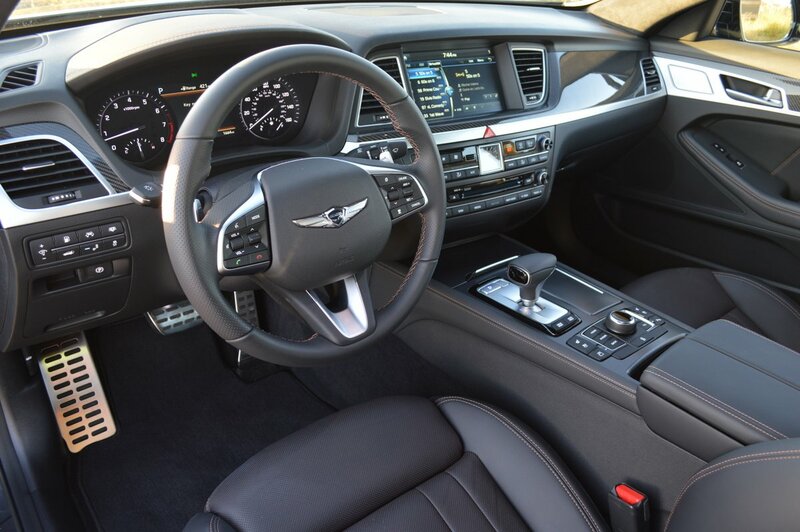 The cabin of the G80 Sport verges on palatial, with lavish spreads of real carbon fiber adorning the dash and doors. 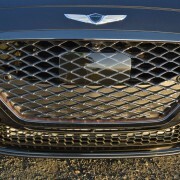 This extravagance, standard on the Genesis, would add thousands of optional dollars to the base price of a comparable German sedan. 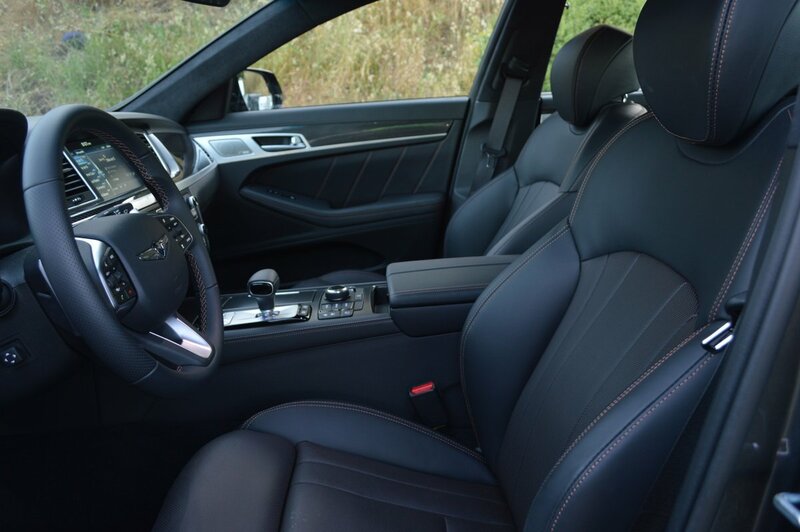 All the seats, door panels and instrument facades benefit from subtle contrast stitching to make the seams look elegant and tailored. 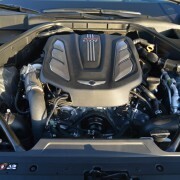 The Sport is also available with all-wheel-drive if that suits your needs, or with a truly earth shaking 420hp V8 that will not require any transmission tweaking to light off instantly. 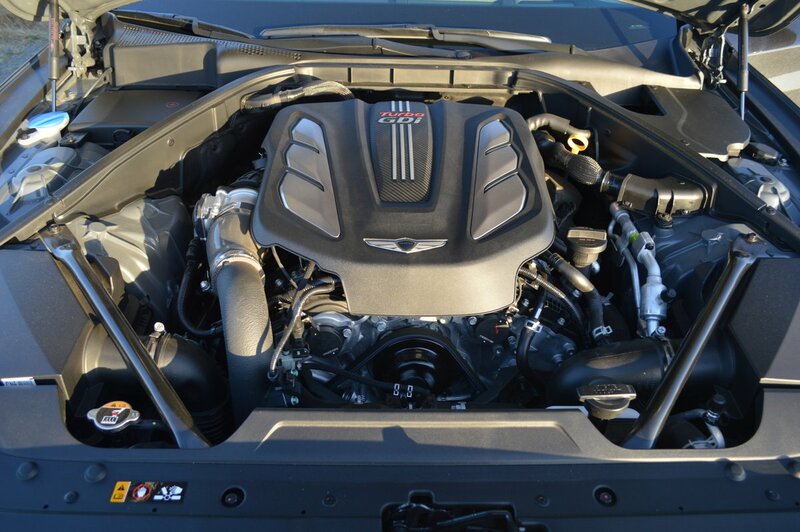 However, the 5.0 liter V8 produces just 7 more foot-pounds of torque than the turbo V6 in our test car (383lb.-ft. for the V8 to 376lb.-ft. for the V6). 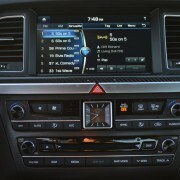 In its first year of existence, the G80 immediately earned a “Recommended” rating from Consumer Reports. 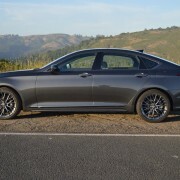 The allure of this fast, capable, handsome family sedan is reassuringly enhanced by the Genesis Warranty, which extends to 60,000 miles over 5 years. 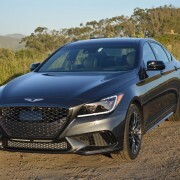 With the advent of this superb new sports sedan, there is less incentive than ever to cross shop the more famous and pricey European name brands in the mid-size field. 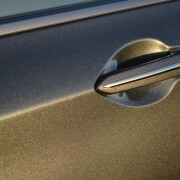 Subaru Outback vs. Jeep Wrangler – Finding the better sand machine.